At the press conference on Wednesday, November 7, dedicated to cellist Mischa Maisky's presence in Bucharest for the concerts on November 8 and 9, 2018, at the Romanian Athenaeum, joining the Latvian soloist were conductor Christian Badea, Andrei Dimitriu, the director of the "George Enescu" Philharmonic, Mirel Taloș, vice-president of the Romanian Cultural Institute, and Tiberiu Mercurian, marketing manager at Alpha Bank, sponsor of the event. "It's very important to have exceptional soloists on the stage of the Romanian Athenaeum. Mischa Maisky's being here with us is a great honour, and this concert takes an example from the golden period of the Philharmonic: 1922-1942. In those 20 years the greatest artists would come from all over the world to perform on the stage of the Athenaeum. Under George Georgescu, the Philharmonic would offer the audience a series of weekly concerts with composers Richard Strauss, Prokofiev, Bartók, Ravel, Stravinsky, Mascagni, who would perform their own compositions in Bucharest, or legendary soloists such as Casals, Enescu, Thibaud, Lipatti, Gieseking, Kempff, Arrau, often times under great conductors such as von Karajan, Böhm, Enescu, Weingartner among many others. So the event on November 8 and 9 mustn't be an isolated case, but rather inscribed in a series of exceptional concerts, named the Concerts of the Centennial at the Athenaeum. We owe this to George Enescu, to the tradition of the «George Enescu» Philharmonic and to the audience", said director Christian Badea, artistic advisor and main conductor of the "George Enescu" Philharmonic. Mischa Maisky, who studied with both Mstislav Rostropovich and Gregor Piatigorsky - thus representing the greatest level of Russian musical interpretation - turned 70 this year. The artist, who is one of the most complex personalities in performance art of the last decades, will perform on Thursday and Friday the Concerto by Dvořák, a reference work in the field of solo performances. "You will have the opportunity of listening to a titan performer alongside titan composers - Enescu, Stravinsky, Dvořák", emphasized conductor Christian Badea. "For me, music is an organism that is very much alive, never the same, that changes according to the partner, the orchestra, the conductor, the hall, the acoustics, and the audience, and plays a very important role and is a source of inspiration for me. I'm very happy to play Dvořák on the stage of the Athenaeum, alongside the Symphonic Orchestra of the «George Enescu» Philharmonic conducted by maestro Christian Badea. One always tries to learn and uncover something new, a new energy. You have to be able to read between the notes. When you interpret music at a very high level, there is no musician, no matter how famous or talented, that can allow him or herself to bring any improvements to the great composers", said Mischa Maisky during the press conference. Andrei Dimitriu, the director of the "George Enescu" Philharmonic, talked about the Centennial Concerts at the Athenaeum in the Year of the Centennial of Romania, when the "George Enescu" Philharmonic celebrates 150 years of existence and the Romanian Athenaeum - 130 years since it inauguration. "It's a consistent season with established names from the musical world. We bring concerts of the first musical institution in Romania, ranked among Europe's musical elite, back to the public attention. Romania has an imperative need to improve its image in the civilized democratic world, and performance culture, when intelligently supported and promoted, can play an essential part in the process. It's a pleasure to have Mischa Maisky on the stage of the Romanian Athenaeum, thanks to the involvement of our artistic advisor, Christian Badea. We thank our sponsor, Alpha Bank, and the Romanian Cultural Institute, who have supported us and made the concerts on November 8 and 9 possible", said Andrei Dumitriu, the director of the "George Enescu" Philharmonic. "There are three main reasons why the RCI decided to support the project Centennial Concerts at the Athenaeum. The first is the very good relationship we have with the «George Enescu» Philharmonic. This year, the RCI took part in several projects, among which I would like to mention the concert of the European Union Youth Orchestra and the one performed by Italian pianist Stefano Bollani. Another reason why the RCI supports the project is the fact that the concerts of the Centennial programme celebrate 150 years since the foundation of the «George Enescu» Philharmonic, and 130 years since the inauguration of the Romanian Athenaeum. The third reason has to do with the efforts of the RCI to promote Romanian culture in the world, with one aspect being the promotion of Romanian music", said Mirel Taloș, vice-president of the RCI. "What I think defines us as people and helps us evolve are the great encounters we have, in which I would include the association between Alpha Bank and this event, but also my personal meeting with maestro Christian Badea, who approached us with this project. Alpha Bank's motto is: «Evolving together» and, starting from here, we support this event in two main facets. 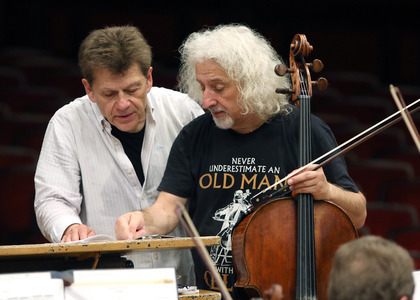 On the one hand, these concerts help Romanian society evolve and, on the other, I'm glad to offer our clients the chance of meeting maestros like Maisky and Badea. We are grateful for the opportunity to be partners at such an event", said Tiberiu Mercurian, marketing director of Alpha Bank, during the press conference. "The Centennial Concerts at the Athenaeum, in partnership with RCI, offer the audience in Bucharest a musical dramaturgy built on the chronology of historical and cultural events linked to the Centennial, through performances by foreign and Romanian artists of international renown. During this «Centennial Season», the «George Enescu» Philharmonic will organize a series of concerts that will reflect the path taken by Romania during the last century, a musical journey that blends with the history of the Philharmonic and the Athenaeum. This time, a musical fresco will complete the epic imagery of Constantin Petrescu's painting from the Great Hall of the Romanian Athenaeum", stressed conductor Christian Badea.